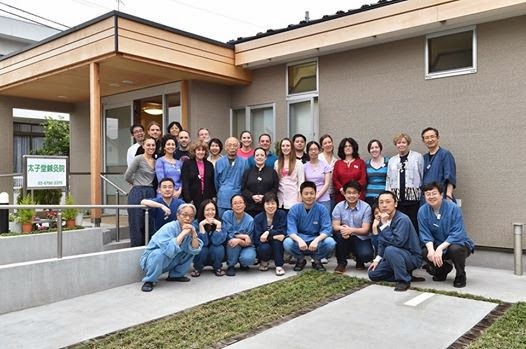 Thank you for coming for "Tokyo Seminar 2014" at Taishido Acupuncture Clinic on 29th April. 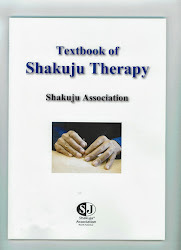 18 acupuncturists, graduates and students at NESA came to study Shakuju Therapy to Komae. 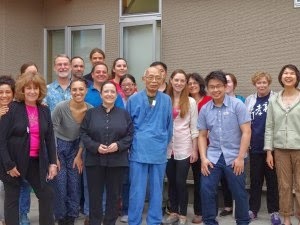 Diane sensei, Robert, Susan, Wyatt, Ellen, Linda and all graduates and students who attended the seminar, how was the seminar??? In the morning, we had a lecture, Kobayashi sensei talked about "Absolute Yin-yang and Relative Yin-yang", one of the core topics in the theory of Shakuju Theory. Once you understand this idea of the Tai-ji, the absolute yin-yang and the relative yin-yang, you can apply this idea to anything, including how to evaluate the condition of the body, etc. In the afternoon session, there was a demonstration treatment by Kobayashi sensei and participants made pairs and practiced the treatment procedure each other. After the seminar, we moved to "Sen no sho　鮮の庄", Izakaya near Komae station and enjoyed the big dinner with Ms. Sue Gorman, the president of NESA and Nancy and Ali. We are all looking forward to meeting you again!!! 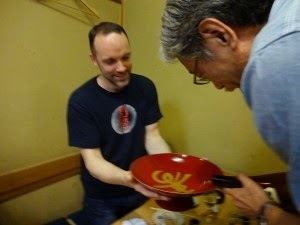 Please enjoy the rest of your stay in Japan and see you again at the next seminar in USA or Japan!! !